I just want to say I have two dogs, one is a 4 year old yellow lab, the other a year old yorkie. 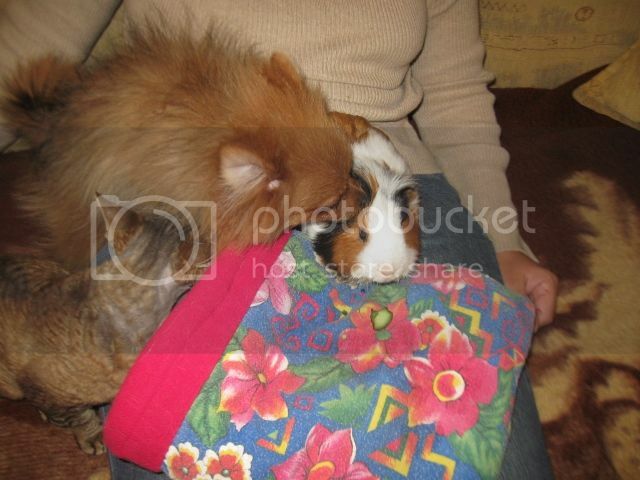 They both have always known guinea pigs, BUT, I would never trust them not to hurt them. Whenever I have the pigs out to clean or examine, the yorkie has to be put in her crate because she does try to bite them. The lab is much less interested but still not to be trusted. I also have 6 cats, and I have never had one of them try to attack a pig. In fact one morning many years ago the cage was left open by accident and one of my ragdolls got in and curled up with my old Bart and napped until my daughter discovered him. Now that is extreme I know and I would never trust them to be alone but I have seen dogs to be more pig aggressive than cats in my experience. But dogs and cats are prey driven and any smaller creature is vulnerable. I don't think there's any specific breed that would be better suited for a good Guinea Pig relationship, except maybe a smaller breed so the piggies have no chance of being accidentally squashed by massive paws. My Aunt has a Golden Retriever who absolutely adores Smokey. I had to dog-sit her for a weekend, and she spent almost the entire time by Smokey's cage. All her play-time with him was supervised, but she had no intention of harming him. Perhaps it's because she was female? She treated Smokey like a fat puppy, even going to far as to nudge him over to her food dish at dinnertime and give him full-body baths! She even snarled at her borther (a bloodhound) when he came over to investigate who was stealing all the attention! I don't have any other pets, but my boyfriend pig-sits for me regularly. He has a Boston Terrier named Edgar. Now, Edgar is about 7 years old and has cataracts in both eyes and HATES all other dogs with a passion. We're pretty sure Edgar either thinks he's human, or we're all just special dogs. 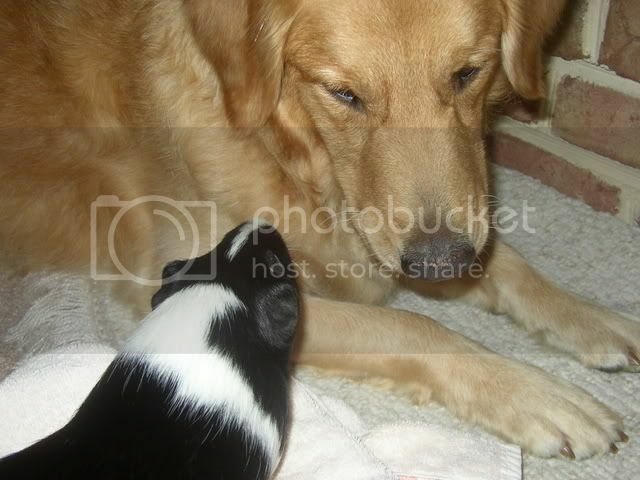 I don't know enough about dogs in general but maybe this has something to do with his attitude towards guinea pigs. As soon as they first entered the house Edgar sniffed the cage bars. He seemed intrigued by the noises, but not enough to investigate. Later on when he saw one in my lap he came over and sniffed and then lay down at my feet. I believe that he assumed the pigs were just a new part of the pack, like I was. He pretty much ignores them, except to get jealous and he takes that out on his humans. In addition, Lola has a crush on him! Every time she hears him coming she runs to the nearest side of the cage and thrusts her nose between the bars to sniff him! Hi we have thirteen pigs running wild soon to be more, jack our 9 year old son, doesn't like thee idea of giving any up. Had to teller of for chasing them to start with, but she was not really out to catch them, there just part of the scene now. They live under a tree outside. nothing can get in there very dense. many animals co exist, together, and are quite mindful of each other very cute. So your pigs live outside 24/7, not in cages? The dog guards them? Males and females living together? Goodness gracious. What the hell? I know. I was hoping to get more info before. . .you know. . . losing my mind., . .
Read my lips. T R O L L.
On the weekend the rescue I foster and volunteer for picked up a girl pig and her lethal baby that belonged to a school...that had nearly a dozen pigs of mixed genders running around outside in a tiny cage and breeding at will. No hay, little water, most have mites or fungal infections. I guess my suggestion is the same as others. No matter how 'sweet' and 'gentle' a dog is with his new friend, it's never wise to trust that instinct won't overrule friendship at some point. A little squeak or chirp or wheek sounds just like a toy, after all or injured prey. my opinion is that if you are going to get a dog, just keep it away from the pigs. Make sure your piggy cage is secure (very secure) and never allow them out for floor time with the dog around. Take extra precautions when you have friends / family / etc. in your house to ensure the safety of your little piggies. I've got a Sheltie /Aussie mix puppy (she's about 18 months old now) and she's been around the pigs since we got her at 10 weeks old. She KNOWS she's not allowed near the pigs area during their floor time (my only concern with her is that she might step on them in her mad dash to eat their poops and their hay - the pigs are just something to sniff at to her). She goes to their C&C cage while they are in it and if the pigs come to the side they get their noses licked and the puppy gets HER nose nibbled on. I've never had issues with her barking (unless someone knocks on our door) but that could be because of her Aussie parts. They can and do get along! To stack odds in your favor I wouldn't suggest a terrier breed for example, but terriers that get along with small animals aren't unheard of. There are common breed traits, but at the same time each dog is an individual. 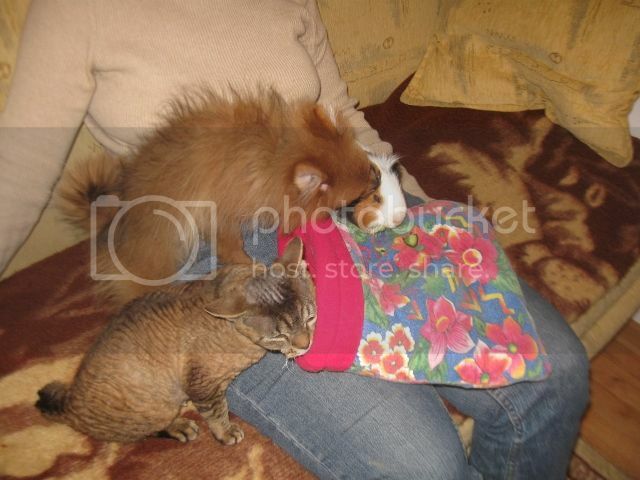 I have a Pom and my mom has a (squeaky obsessed high drive) Silky Terrier. 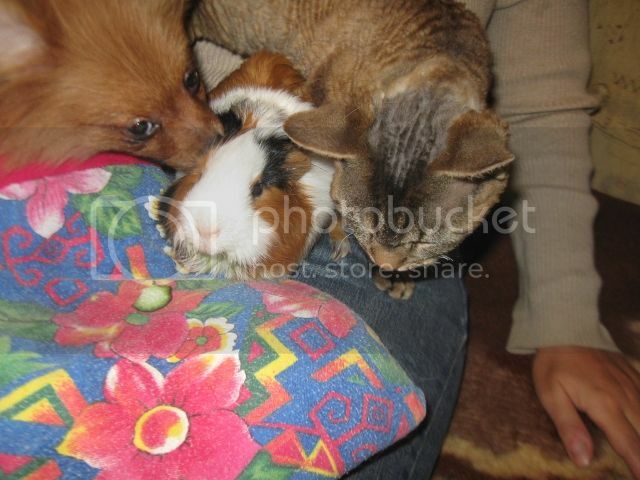 Obviously I was more strict about the Terrier interacting with the guinea pig than my Pom. They were both very respectful of the rules though. I set up a perimeter with carpet mats and they had to stay beyond that if I had to open up the cage for something. Once the door was closed and secured I gave them the ok and they could look at her all they want. They loved "watching tv." Any disrespectful behavior such as pawing at the cage or barking was discouraged. 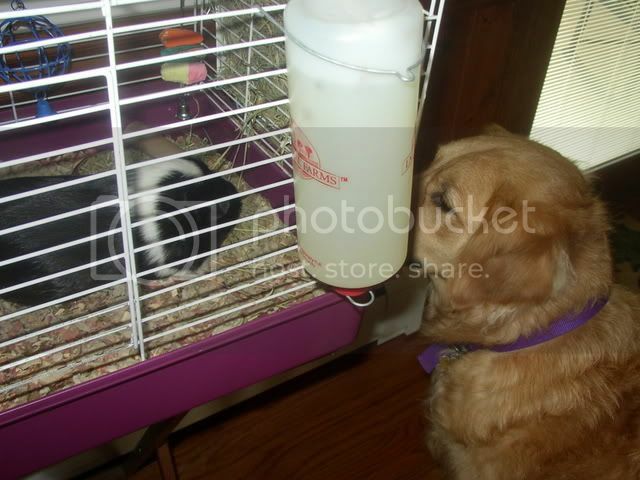 I thought my guinea pig would get stressed out with a big wolfy looking thing staring at her all the time but she was the most chill pig I've ever had and just went with the flow. She would even venture into the dog crates and drank out of their water bowl. The dogs were either gated or crated during floor time. If you have a yard, make sure to designate a clean yard area for the guinea pigs as they shouldn't be placed on or allowed to eat soiled grass. This is my Pusio, who was already very sick then, and my neighbour's Pomeranian and Devonshire Rex cat. They were both fascinated by my guinea pig, and very respectful. The dog licked Pusio's ears as if he were a puppy. The cat liked the herbivore smell very much and tried to rub it all over herself. Both the dog and the cat are females and they are very friendly. Nevertheless, I had the piggie on my lap and kept very close eye on "predators".